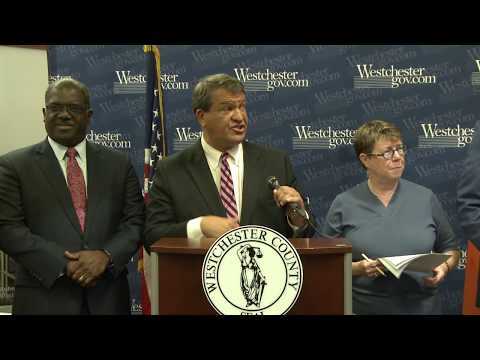 County Executive George Latimer announced new initiatives on Monday, Aug. 13 to reduce noise, water pollution and air emissions at Westchester County Airport. “Back in May, we announced a series of public meetings, where we heard from everyone who wished to speak, and each had a chance to talk about the challenges facing the airport," Latimer said during a Monday news conference, which can be viewed below or by clicking here. Regarding airport operations, by no small margin, the largest numbers of concerns relayed revolved around noise. In response, the Latimer Administration has developed both immediate and longer terms actions to reduce noise and to better respond to noise complaints. Portable Monitors – the Administration has ordered 10 portable noise monitors which will be ready to be placed in key locations by Aug. 31. Upgrade Fixed Monitors – the current fixed noise monitoring system includes some monitors that are more than 20 years old, using obsolete technology. Complaint Handling – The Administration is in the process of automating the complaint response system. The Administration is now starting a current inventory of air emissions and greenhouse gases, creating an air dispersion model, and setting up an emissions monitoring system. The results of the new monitoring system and inventory are expected to take approximately four months to receive back. Input on the future of Westchester County Airport also included much discussion of water quality. The airport water quality testing program, which ended under the previous Administration, has been resumed. The Administration has located 49 of the monitoring wells, and will begin water sampling by Aug. 31, with preliminary test results expected by the end of September. Lastly, Latimer provided an update on the status of the Airport Master Plan. The Airport Master Plan and Airport Layout Plan, along with transcripts of the public hearings and written public comments, were submitted to the FAA by their July 6 deadline. Meanwhile, the the Business Council of Westchester issued a statement saying it is deeply concerned about the future operation and health of the Westchester County Airport. As a result, it recently announced the formation of the Coalition for the Westchester Airport to provide a unified voice for the airport business and employment community, as well as the interests of the business and general traveling public. In the coming weeks the coalition will be an active participant in the dialogue.